US ambassador to the UN tells Security Council many countries would respond with far greater force if faced with Hamas violence than Israel. US Ambassador to the UN Nikki Haley said that the IDF acted with "restraint" in dealing with violent riots along the Gaza border Monday. "In recent days, Hamas terrorists, backed by Iran, have incited attacks against Israeli security forces and infrastructure. That is violence that should occupy our attention too," Haley said during an emergency meeting of the UN Security Council. "No country in this chamber would act with more restraint than Israel has," she added. "In fact the records of several countries here today suggest they would be much less restrained." She said that the UN continued to demonstrate "double standards" against Israel. The US ambassador called on the UN to focus its attention on Iran's destabilizing actions in the Middle East. Haley criticized those who say that the opening of the US embassy in Jerusalem yesterday directly caused violence. "How is that justified?" "Let's remember that the Hamas terrorist organization has been inciting violence for years, long before the United States decided to move our embassy. "In recent days, multiple news organizations have documented the Hamas incitement in Gaza. They have documented the Hamas maps and social media which show the fastest routes to reach Israeli communities in case demonstrators make it through the security fence. 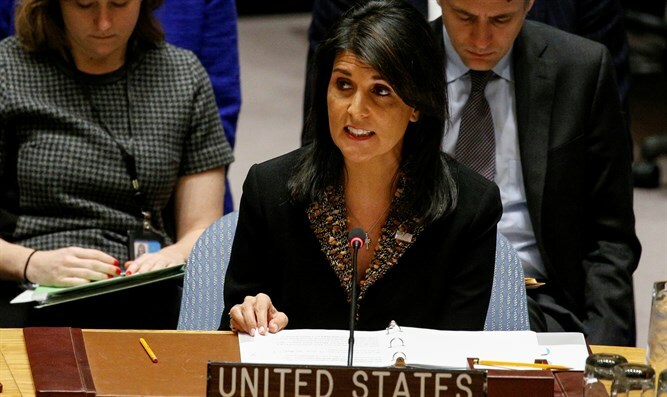 They have reported o Hamas messages over loudspeakers that urge demonstrators to burst through the fence, falsely claiming Israeli soldiers were fleeing, when if fact, they were not," Haley said. "Hamas has attacked the Kerem Shalom Crossing, the biggest entry point in Gaza for fuel, food and medical supplies. This is how determined they are to make the lives of the Palestinian people miserable." Addressing the Security Council members, Haley asked: "Who among us would accept this type of activity on your border? No one would."